Hubsan is a true hub for drones. 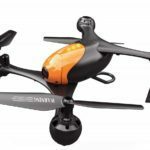 Whether you want an FPV drone, a small fun drone under 100, a racing drone or any other, Hubsan has something for everyone. One thing that makes their drones stand out is that they make them with incredible color combinations. For example, the Hubsan H117S Zino is white and black, so sleek and stylish. The H123D X4 Jet is black and green. And just when you thought that they cannot get any better, you find the red and white H502E X4 Desire. But looks are no good if the drone does not have nice and advanced features to match those looks. However, the H117S Zino is not disappointing at all. It offers good value for money in looks, performance and features. The first thing that you will notice about this drone is the medium size. It measures 30.5 by 25.2 by 9.0cm (L*W*H). 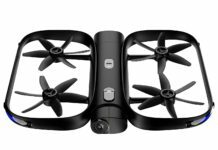 At the weight of 700g without the propeller guard, you can see that you will have to register it with the FAA and create space in your backpack when traveling with your drone. This is a camera drone. It has been equipped with a 4K Ultra HD camera. If you are video and photo freak, you know that this camera meets all of your indoor and outdoor photography needs. The camera is mounted on a 3-axis gimbal system. What this means is that even when you are flying the drone in windy conditions, it stays stable and captures nice video footage. If you want a panoramic video and photography experience, just press the button for panorama. You do not have to worry about panning the drone mid-flight. Get a firsthand FPV experience with this camera. See what the drone can see just as if you were inside the drone. The live video transmission also means that you can share the videos with your family and friends on social media in real-time. With a video transmission distance of 1000 meters, you can capture footage far and wide. 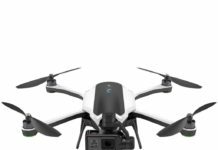 The drone is sold with an advanced, intelligent battery. This is a LiPo 11.4V 3000mAh battery that shows its status of charge on the controller and on the app. You will get a flight time of 23 minutes, give or take a little. You can check on the Hubsan website whether you can order a spare battery for your drone, alongside other spares when you need them. If you double your flight time to 45 minutes, you will enjoy the drone much more. The charging time for this battery is 180 minutes. This is a brushless motor drone. When you consider the benefits of a brushless motor for a drone, then you can see why the Zino is referred to as the best value drone. Brushless motors make a drone quiet and more effective. It also requires fewer repairs over time, as compared to its brushed motor counterparts. For portability, you will be happy that this drone is foldable. The arms fold nicely close to the body of the drone reducing it to a compact size. You can pack it away in your backpack easily without disassembling the rotor arms. For safety, the drone has failsafe features. First, if the battery runs low, the drone will turn and return back home. Secondly, if the signal or connectivity with the controller or Wi-Fi is lost, the drone will turn back home. This is an automated feature, so you do not have to worry about losing your drone. Engage the target lock feature if you would like the drone to follow a target. You may also draw a trajectory flight plan on your smartphone and the drone will follow that route. If it meets obstacles along the way, it will bypass them, so you do not have to wind you route around the obstacles. Other features include automatic return home feature as discussed above. Headless flight means that you need not worry which direction the nose faces. Altitude hold is quite effective and so is the automated takeoff and landing. I bought my H117S Zino from Hubsan and I have enjoyed using it very much. I think it is good value for money. Long flight time and foldable design makes it a good deal for me. 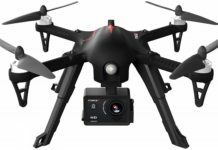 Harry S.
At first, I though the price was too high but after using the 4K ultra HD camera, I am glad I bought the drone. I have just flown less than ten times but I am planning to test all of its features soon. Reuben K.
I consider myself experienced in using drones. Thus, when I see features such as 3-axis gimbal, 4K camera and others, I know it is a good drone worth buying. Jacinta A. This is my first ever drone. When I ordered it online, I was looking for a drone that I would not outgrow anytime soon. I do not think I will ever outgrow this one. Alfred H.
This is a pricey drone but you will get the best value for all the money that you will pay for it. 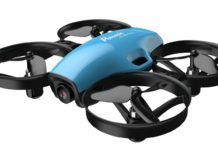 The colors are quite stylish and the drone has many advanced features. David W.
Good flight time, many safety features and durable construction. 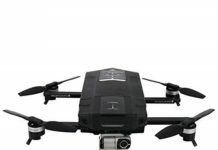 This is a good drone for the money! Gad T.
Who Should Buy The Hubsan H117S Zino? 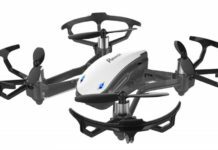 Anyone who values good quality and value for their money should go for the Hubsan H117S Zino drone. It is incredibly good and it does everything that the manufacturer says it can do. 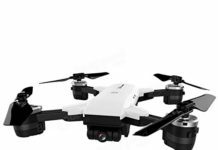 The long flight time is good for fun and the safety features make it a nice drone for beginners. When you fly it a couple of times, you will see why it is referred to as the best value drone. 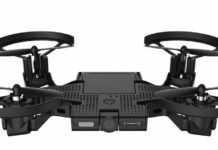 For the first time, here is a drone that you can buy and just have fun flying. Mostly, if you have been following our reviews, you will see that we recommend a spare battery for more flight time. If you would like to fly and capture video for more than 23 minutes, visit Amazon website and order a second one. The Hubsan H117S drone is durably built and will stay intact for a long time. How to Know Where You Can Fly a Drone?